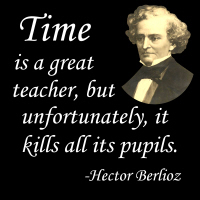 Composer Hector Berlioz’s witty and unsubtle irony is sure to please musicians and non-musicians alike. Now you can own this delightful quote (or give it away to your favorite music lover or armchair philosopher) on many marvelous apparel and merchandise options, as seen below! Buy it now on a t-shirt, hoodie, mug, tote bag or other quality giftware and apparel items. Choose something for your favorite musician, music teacher or student, exclusively from GearGems!